Anvils - forges & equip. The Diamond® Alliance is a think tank of innovators, set up by the Royal Kerckhaert Horseshoe Factory. The core is formed by a group of devoted, highly skilled experts from various industries. By combining individual strengths with innovation and state-of-the-art manufacturing technology we are able raise industry standards and provide you with a better experience. Through synergy Diamond® can create better products and contribute more to both your work and your business. This makes Diamond® one of the most sought after tool brands in the world. Why did Kerckhaert choose the name HYBRID? The Royal Kerckhaert Horseshoe Factory designed HYBRID™ horseshoe nails to bring simplicity and at the same time give the farrier more options. 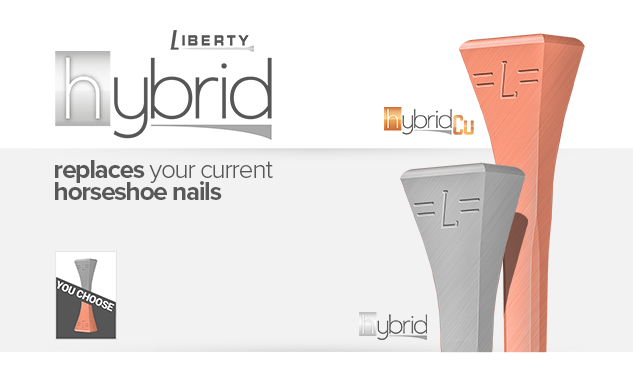 By combining the best features of the most popular nail styles with the superior Liberty manufacturing technology, we were able to design one, all new horseshoe nail, that that gives better results, every time.